What makes suicide bombers capable of sacrificing themselves for a belief? Why do members of one race believe they are superior to another? How do subliminal messages affect the outcome of political polling? Using the tools of neuroscience and social science, researchers have learned a great deal about the brain's role in human behavior and interactions. This volume is the proceedings of the first Barcelona Social Brain Conference, which was organized by the New York Academy of Sciences, the Fundació Catalana per a la Recerca i la Innovació, the Càtedra UAB "el cervell social," and the European Science Foundation. Through a neuroscientific lens, the invited chapters examine the human qualities of empathy, sacred values, and cooperation, and focus on the ways in which what they learn can be used to understand human conflicts. 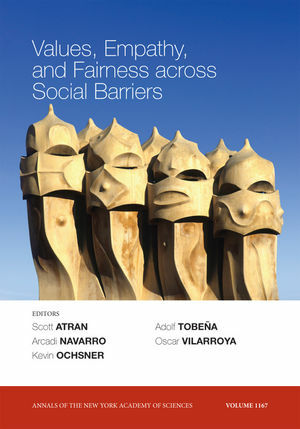 Oscar Vilarroya and Scott Atran are the authors of Values, Empathy, and Fairness across Social Barriers, Volume 1167, published by Wiley. Foreword (Scott Atran, Arcadi Navarro, Kevin Ochsner, Adolf Tobeña, and Oscar Vilarroya). Keynote Lecture: Lethal Altruists: Itineraries along the Dark Outskirts of Moralistic Prosociality (Adolf Tobeña). Part I. From Animosity to Empathy: Neuroimaging Studies. 1. The Need for a Cognitive Neuroscience of Naturalistic Social Cognition (Jamil Zaki and Kevin Ochsner). 2. From Dehumanization and Objectification, to Rehumanization: Neuroimaging Studies on the Building Blocks of Empathy (Susan T. Fiske). 3. When the Self Becomes Other: Towards an Integrative Understanding of the Processes Distinguishing Adaptive Self-reflection from Rumination (Ethan Kross). 4. Differential Roles of Fairness- and Compassion-based Motivations for Cooperation, Defection and Punishment (Tania Singer and Nikolaus Steinbeis). 5. The Development of Adolescent Social Cognition (Stephanie Burnett and Sarah-Jayne Blakemore). Part II. Genetic Markers for Good and Bad Cooperators: Fairness Studies. 6. Genoeconomics: promises and caveats for a new field (Arcadi Navarro). 7. Experimental Game Theory and Behavior Genetics (David Cesarini, Christopher T. Dawes, Magnus Johannesson, Paul Lichtenstein, and Björn Wallace). 8. The Neurochemistry of Fairness: Clarifying the Link between Serotonin and Prosocial Behavior (Molly J. Crockett). 9. Arginine Vasopressin and Oxytocin Modulate Human Social Behavior (Richard P. Ebstein, Salomon Israel, Elad Lerer, Florina Uzefovsky, Idan Shalev, Inga Gritsenko, Mathias Riebold, Shahaf Salomon, and Nurit Yirmiya). 10. Empathy in Early Childhood: Genetic, Environmental and Affective Contributions (Ariel Knafo, Carolyn Zahn-Waxler, Maayan Davidov, Carol Van Hulle, JoAnn L. Robinson, and Soo Hyun Rhee). Part III. Sacred Values in Social Conflicts: Anthropological Perspectives on Fairness. 11. What Motivates Participation in Violent Political Action: Selective Incentives or Parochial Altruism? (Jeremy Ginges and Scott Atran). 12. Tribal Instincts, Male Warriors, and the Evolutionary Psychology of Intergroup Relations (Mark Van Vugt). 13. Précis to Implicit Nationalism (Ran R. Hassin, Melissa J. Ferguson, Rasha Kardosh, Shanette C. Porter, Travis J. Carter, and Veronika Dudareva). 14. Reason within Passion: Values as Motivational Anchors of Israeli Opinion on the 2006 Lebanon War and Ceasefire (Lilach Nir and Ariel Knafo). 15. Sacred Values: Psychological and Anthropological Perspectives on Fairness, Fundamentalism and Terrorism (John Thomas Alderdice). 16. Neural Basis of Preference for Human Social Hierarchy versus Egalitarianism (Joan Y. Chiao, Vani A. Mathur, Tokiko Harada, and Trixie Lipke). 17. Empathy Towards Strangers Triggers Oxytocin Release and Subsequent Generosity (Jorge A. Barraza and Paul J. Zak). 18. On Hotheads and Dirty Harries: The Primacy of Anger in Altruistic Punishment (Elise C. Seip, Wilco W. van Dijk, and Mark Rotteveel). 19. Neural Correlates of Social Decision-Making and Relationships: A Developmental Perspective (Berna Güroglu, Wouter van den Bos, and Eveline A. Crone). 20. Suicidality Connected with Mentalizing Anomalies in Schizophrenia: A Study with Stabilized Outpatients (Rosó Duñó, Esther Pousa, Mónica Miguélez, Itziar Montalvo, David Suarez, and Adolf Tobeña). 21. Neurobiological Substrates of Social Cognition Impairment in ADHD: Gathering Insights from Seven Structural and Functional Magnetic Resonance Imaging Studies (Joan Carles Soliva, Susanna Carmona, Jordi Fauquet, Elseline Hoekzema, Antoni Bulbena, and Oscar Vilarroya). 22. Agent-based Computer Simulations of Language Choice Dynamics (Tarik Hadzibeganovic, Dietrich Stauffer, and Christian Schulze). 23. The Use of Supernatural Entities in Moral Conversations as a Cultural-psychological Attractor (Tamás Tófalvy and Hugo Viciana).